Steve Hinton Jr. believes “Voodoo” can go even faster. 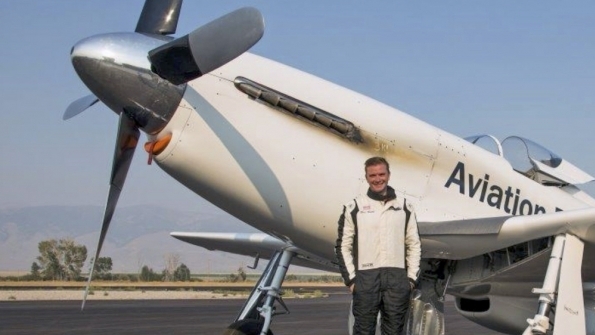 Famous for its advanced-technology winglets, Aviation Partners, Inc. helped drive Steve Hinton Jr. and his highly modified P-51 Mustang to a new world record without them. “I came through the trap at 100 ft. and 560 mph,” says pilot Steve Hinton, showing the potential of the famous racing P-51 “Voodoo.” That was to be the best it could show as an ailing engine trimmed average speed over four timed runs to 531.53 mph – but enough to make Hinton the fastest piston-engine pilot on the planet. That’s not the first world record for API (Booth C8110). It began with Blended Winglets for the Gulfstream II in the early 1990s, with which aviator Clay Lacy knocked two hours off the Los Angeles to Paris world speed record in a Blended Winglet-equipped Gulfstream II (or IISP) in 1995. The next year, Lacy established seven new time-to-climb records in the IISP, including a dramatic climb from sea level to 40,000 ft (12,000 m) in just six minutes and 20 seconds. He did, and he told Hinton API would be interested only if it could add value. The result? It redesigned the wing, Clark told ShowNews. Instead of building a new wing, API designed panels to attach to the surface to change the airfoil. They actually made the wing thicker, by almost 2.5 inches at the trailing edge where they met the flaps. Clark said API learned “a couple of secrets” from the exercise where the envelope could be pushed a little more, but they’re going to stay secret for now. So are details of two or three new advanced winglets API is working on for commercial airliners, though he let slip that development is under way on radical split-spiroid winglets. API is also looking at load alleviation as a way to add winglets without the need for so much additional structure in the wing. Winglets bring more efficiency in high-speed cruise. They reduce the drag of a wing by effectively increasing both its span and its aspect ratio. Voodoo doesn’t care about fuel economy and owes its performance to the philosophy of brute force where minimum wing (with drag reduced by clipping it 2.5 ft. from standard) plus maximum horsepower (3,100 hp) equals maximum speed. Steve Hinton Jr., who last month broke the world speed record for piston-engine propeller aircraft, is here every day at Aviation Partners, Inc. (Booth C8110), whose aerodynamic expertise made the victory possible. “They did a lot of work that was actually quite revolutionary in that with all these racers and high-performance aircraft no one has actually changed the airfoil before,” Hinton told ShowNews. “It looked pretty radical! “A lot of people in the industry were a bit skeptical because it has never been done before. But API was able to apply its CFD tools to the airfoil. I was really surprised that the wing acted just like they said it would,” Hinton said. “We essentially moved the thickest portion of the airfoil back on the wing to reduce the shockwave. You would think a real thin wing would go the fastest.